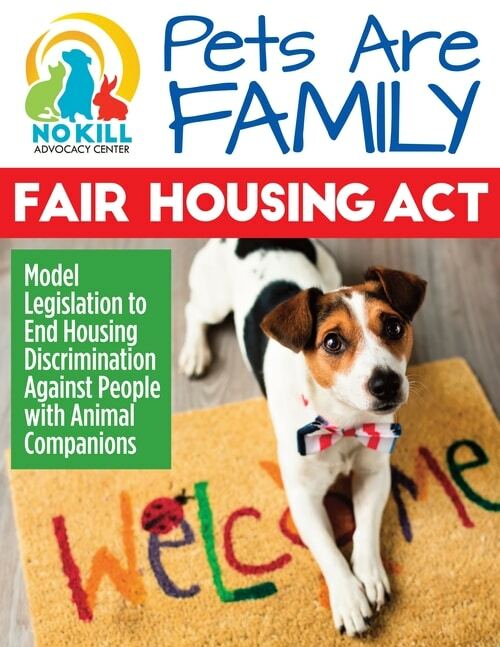 Announcing the “Pets are Family Fair Housing Act,” the latest FREE guide and model legislation from the No Kill Advocacy Center. For the vast majority of people, the bond they share with their animal companions is a familial one, born of love and mutual affection. And yet, many families are unable to find rental housing because of discrimination against their animal companions, breaking up families and, in some cases, even leading to homelessness. Those already in rental housing where animals are not allowed may be forced to choose between losing a family member or losing their home. Indeed, lack of pet friendly housing is a major reason for pet abandonment and relinquishment to animal shelters. It doesn’t have to be this way. As long as reasonable concerns about pets are addressed—such as a deposit against damage—the privilege of living with a dog, cat, or other animal should not be reserved to those fortunate enough to own their own home. Ensuring fair housing opportunities would not only benefit animals by increasing adoptions from local shelters by opening up available homes for people who want them, but it would benefit people, too. Companion animals not only improve cardiovascular health and reduce feelings of loneliness, but a University of Denver study found broader impacts on public health and social cohesion, including increases in social contacts and civic engagement and “perceptions of neighborhood friendliness.” In addition to reduced costs associated with killing at the local shelter as well as an increase in adoption revenues and other user fees, such a policy would lead to increased spending in the community, as well as additional tax revenues from that spending. For a copy of the free guide, click here. For a guide to get the law introduced, click here. For a copy of all 28 free guides, everything from protecting animals from abuse, banning the gas chamber, turbocharging your adoption program, to ending the killing altogether, click here.